I was learning fast on the river Nigu. How to line a canoe through rapids, how to read the river and what strokes to use during what manoeuvres. It was important that both ourselves and our cargo stayed safe as it would be several hundreds of kilometres before we saw another human outside of our party; we were very much on our own. Therefore it was fortunate for me that I had Jamie at the back of the boat. Jamie had done quite a lot of white water paddling as a teenager and this helped to average out our experience. Precisely seven days before we left for Alaska I had undertaken two hours of canoe training on the Thames in Oxford. But hey, what could possibly go wrong? The idea for the Arctic Slope Expedition came from Lou. She’d had her eye on a river trip (a “float” as the Americans would call it) down the Colville River in northern Alaska for some time. When our plan to explore caves in remote Uzbekistan started to fall about due to permission problems this sounded like something exciting and remote that our team of six could do at short notice. The idea was to put in on the Nigu (a tributary of the Etivluk, itself a tributary of the Colville) and travel downstream repeating the river logs made in the 1970’s to look for changes that could be related to human impacts or changing climate. I had only limited time off from work and suddenly everything seem to be happening really quickly. Jet lagged after a 28 hour journey and a 9 hour time difference I slept little on my night of arrival in Fairbanks, Alaska. Luckily Jamie, Andrew, Tim & Lou had arrived earlier to arrange food and the canoes so that Ben and I could just get up the next morning and start the journey to the wilderness. First we flew a schedule service on a small 10 seater aircraft to the city of Bettles. 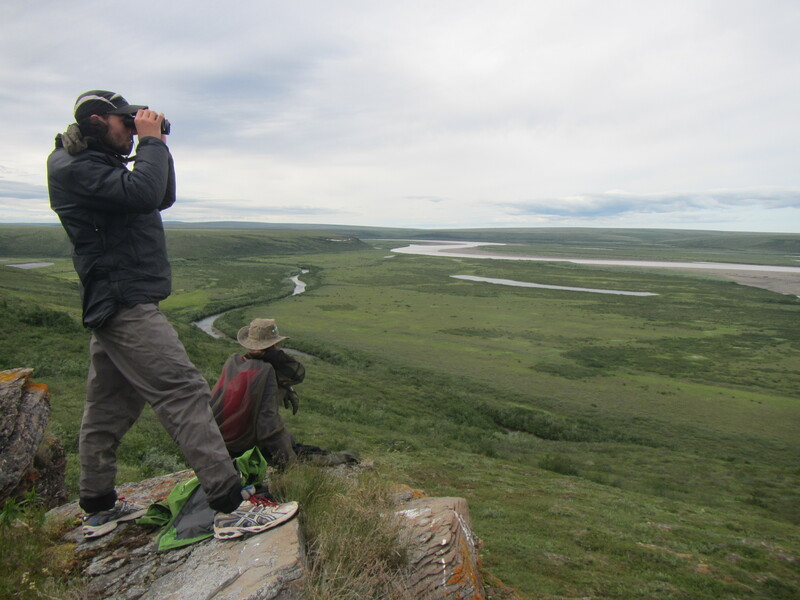 Bettles only has 12 permanent residents and is a starting point for trips into the Gates of the Arctic National Park. The original plan was that we would spend the afternoon and evening here sorting kit before Brooks Range Aviation dropped us into the Nigu the next day. However the weather was really good and they were keen to get us going as soon as possible. Suddenly we were in a rush, packing and weighing everthing to make sure we didn’t exceeded the capacity of the beaver float planes that would take us into the wilderness. Then we were off; two beavers, each with three passengers and all our equipment. 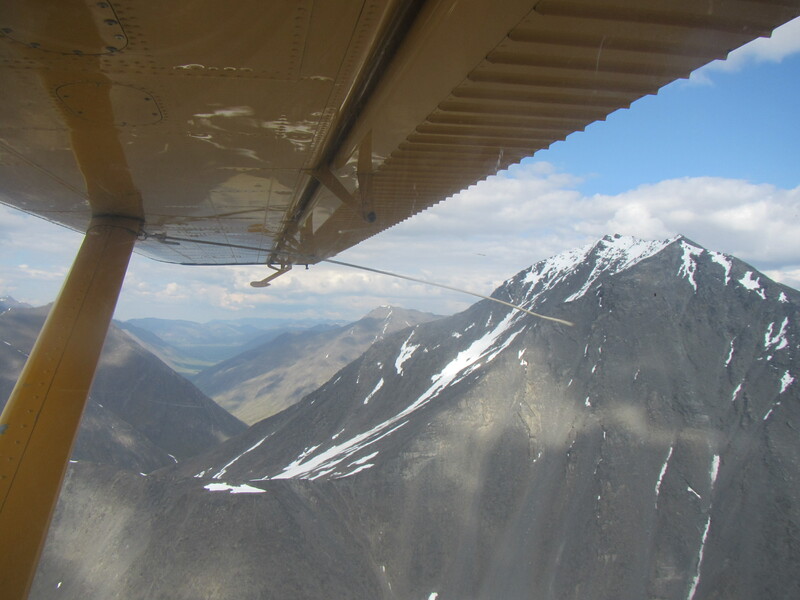 As we flew over the amazing Brooks Range mountains I couldn’t stop thinking that yesterday I had been in London. I don’t really like flying. The smaller the plane the worse it is and the put-in flight was definitely a tester for me. 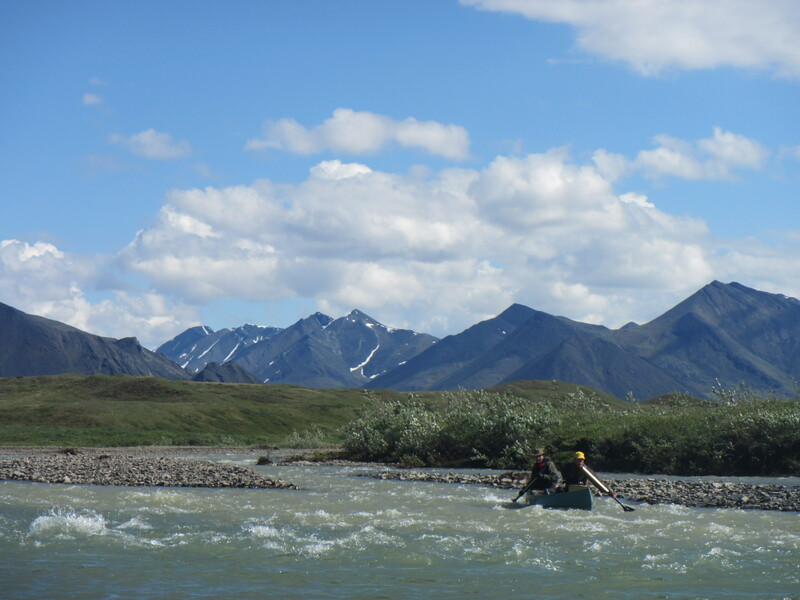 The were mixed extreme emotions of marvel at the Brooks Range, seeming to stretch out to infinity, and anxiety as our tiny craft picked its way through the hills. They had said of our pilot “he likes to fly close to the mountains” and he sure did. This felt like one of the most exciting experiences of my life. After an hour or so we had crossed the watershed and started descending. The plan was to put us in at a small lake near the head waters of the Nigu. This was much higher up that we had originally planned but it had rained extensively before our arrival and this upper section was expected to be navigable in these conditions. The pilot circled the lake once to check it out and then banked steeply to bring us into land. We unloaded and then a few minutes later the second beaver approached. Within half an hour all the expedition gear was ashore and we watched as the planes left us, just small dots heading back to Bettles. Now it was just us and the wilderness. Well, actually, not quite just us. That first night we learnt an important lesson: about the mosquitoes. 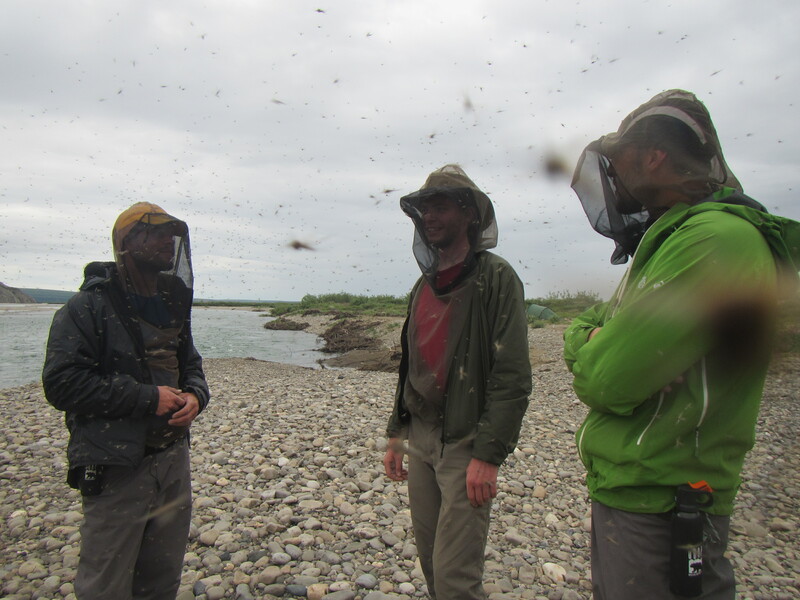 Tim and Lou had paddle arctic rivers before in Canada and so we had come prepared with bug jackets and deet. However, I don’t think anyone was truly prepared for the severity of the problem. As legendary arctic explorer Helge Ingstad put it “the mosquitoes are intolerable”. We quickly learnt that simply covering up wasn’t enough. You either needed to wear plastic or clothes suitably thick that they couldn’t bite through it. The weather was hot the first few days and it was indeed fairly intolerable. Still jet lagged, we were sweating as we put together our folding canoes while clothed in rain jackets and plastic “dry trousers”. Most of us had purchased dry trousers especially for the trip, imaging their usefulness as we waded the boats through the shallows, not anticipating that we would live in them as the perfect insect protection. After a night by the lake it was time to start paddling. A small channel connected the lake to the Nigu, but it was quite shallow and we mostly needed to line the boats. Once on the river proper things improved, although we still had to get out and drag occasionally. But were lucky only once to have to unpack and portage properly. By the first night we were paddling the majority of the time, rapidly making miles down the river. We paddled all day and then made camp in the standard bear precautionary triangular pattern, eating, sleeping and storing food at the three corners of the triangle and always sleeping upwind from the food. But with a large party size of six it was fairly unlikely we would have bear trouble. Still, better safe than sorry. As each day went by the mountains behind us retreated a bit more. We had some elevation to lose and there were small but not too intimidating rapids to negotiate as we lost height. 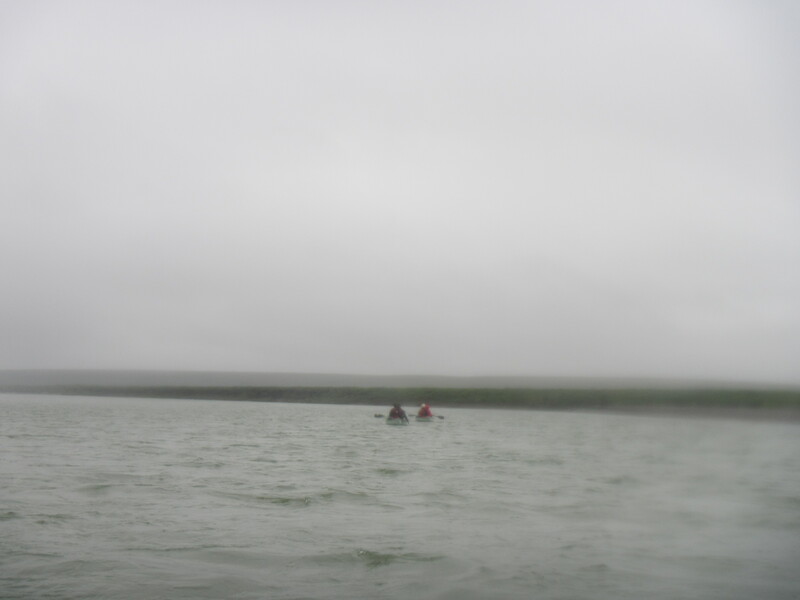 Never having travelled on a river for so long before I had not anticipated the intense stimulation of navigating. It wasn’t just a case of following the river. We had to decide what line to take in the rapids, or even whether we should shoot the rapids at all (we could always line the boats or portage if they looked too hard). Then there were decisions to make as the river braided and split into many channel, which way would have the least chance of running aground? I loved being the lead boat, seeing the new section of river for the first time and quickly taking decisions about the course to follow. The further downstream we went the bigger the river became until one day we eased into the Colville itself. Our little channel from the lake to the Nigu seemed like a long way away; now we were on a vast expanse of water within the huge landscape of the tundra. Somewhere around this point we passed through the furthest point from a man-made structure in the whole of the United States. It was just us. Well, us and the mosquitoes and the rest of the wildlife. A really exciting prospect for the trip had been the possibility of seeing big wildlife in its natural habitat. Early on we did see a bear, but it was so far away that even with binoculars I could barely tell that this was what it was. Then one day we came round a braid in the river and Jamie spotted it. A huge brown bear sat on the opposite sand bank. We all quickly pulled in to the side and watched it forage, separated only by a small bit of water. 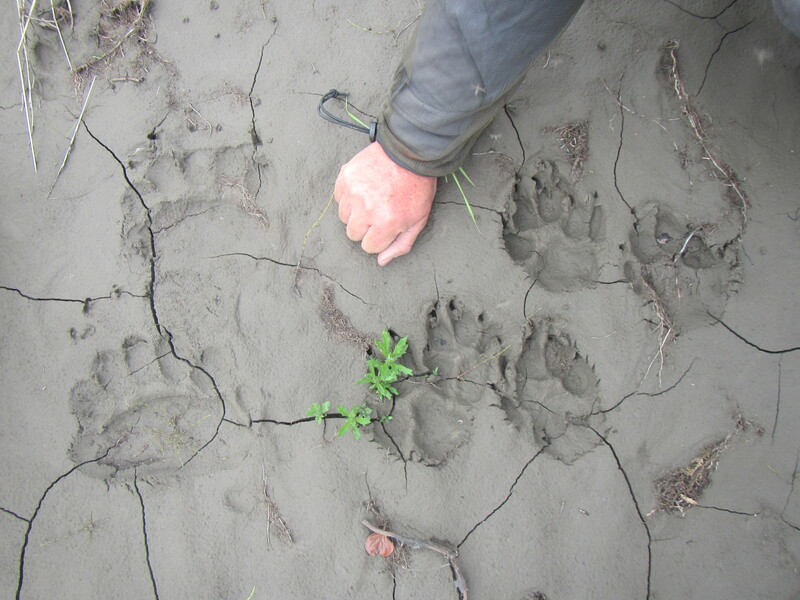 I say the bear was huge, but Tim (a zoologist) said it was juvenile and not that big. Still it was big enough for me. After about five minutes it came far enough down the sand bar to come downwind of us. With one whiff of us smelly humans it turned tail and bounded away. A magical moment while it lasted. We also saw moose, caribou, a wolf, ground squirrels and lots and lots of bird life, including bald eagles, golden eagles, loads of falcons, lunes, migrating sandhill cranes and much more. Thankfully, signs of human activity were rare. 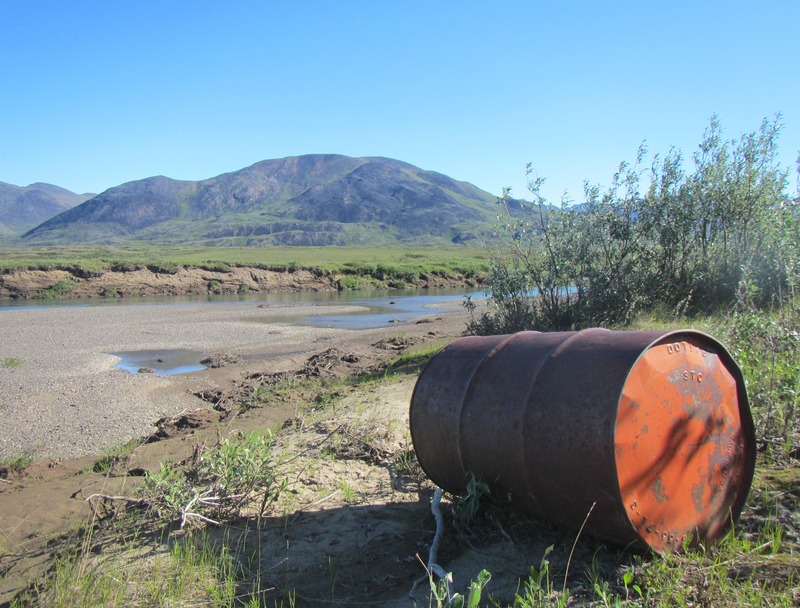 We saw one old fuel drum, presumably dropped from a plane and the remains of one old structure on a hill above the river. Somewhere someone (hunters presumably) was building some kind of new cabin, but otherwise the vast wilderness was mercifully untouched. Once we were on the Colville itself we were really motoring. The unseasonable amount of recent rain meant the river was really fast; sometimes we clocked 18 kmph on the gps. 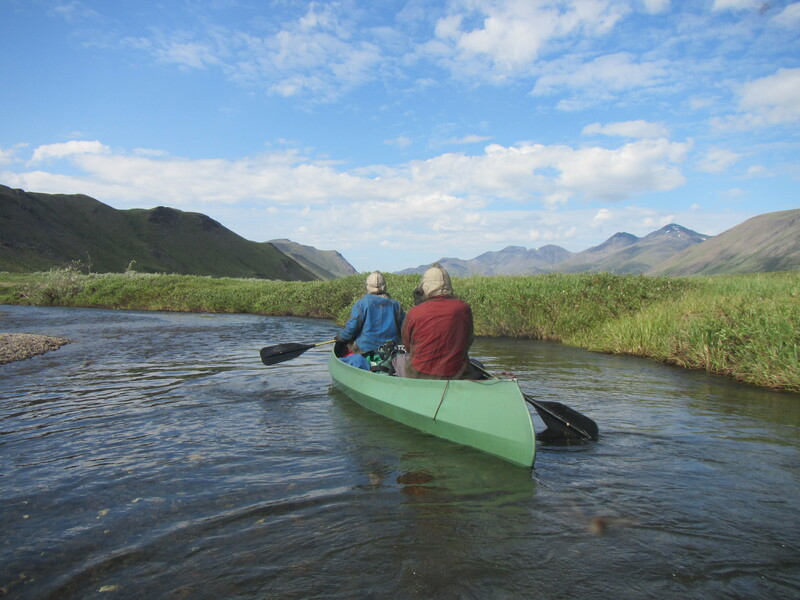 While superficially the river was easier now with no rapids, objectively it was probably more risky as it was progressing faster than we could paddle. If anyone or any kit had gone overboard we might not have seen it again. 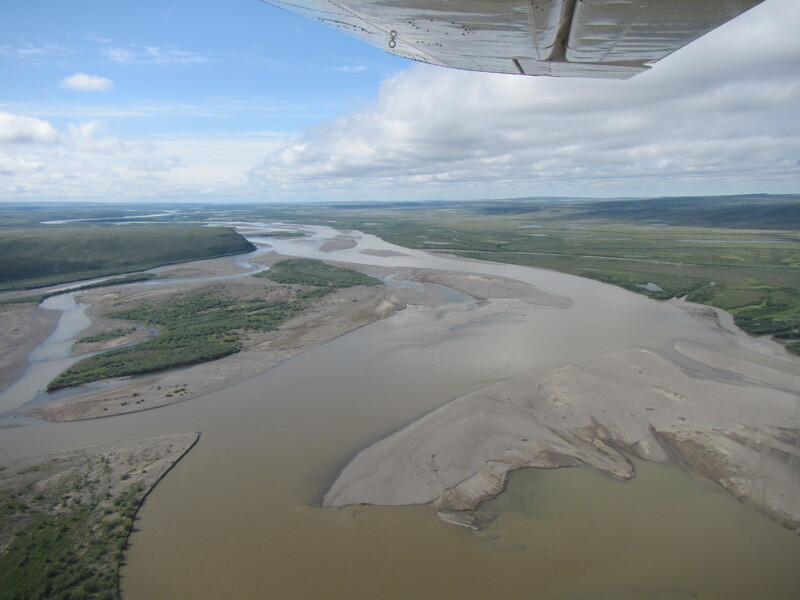 The fast river was also bringing a lot of sediment down from in the mountains. This meant that we couldn’t directly drink the river water and had to always be on the lookout for side streams which might be clearer. Often these were brown from the tundra through which they were flowing but this was always preferable to the milky silt laden Colville. You really begin to understand the power of geomorphology when you travel down such a vast river in such a small boat. It continued to rain at various points during our journey and we saw the level of the river rise and fall. With a complicated and very large catchment area it was hard to predict how the water levels would behave, but very important that we thought about it so as not to get washed away in the night. The further downstream we went the higher the water levels were with respect to the landscape. Basically the Colville was in spate. 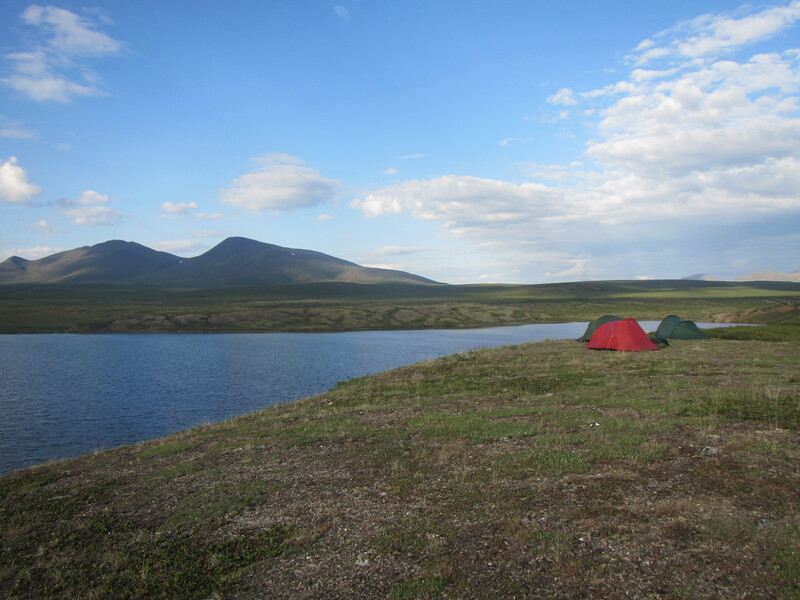 Throughout our journey we camped on sand and gravel bars directly adjacent to the river. The tundra behind is just too bumpy and covered in vegetation to make camp on. But in the last few nights we struggled to find anywhere to stay that was more than a metre or two above the water. Lou and I took to making markers at the water edge to see if the levels were rising or falling before we went to bed. And we always made sure we carried the canoes up to the same level as the tents. It would just a tiny bit problematic to wake up and have no transport. Then suddenly, after two and half weeks, we were onto our last night in the wilderness. With only a handful of miles to Umiat where we were due to take out, our journey was almost over. 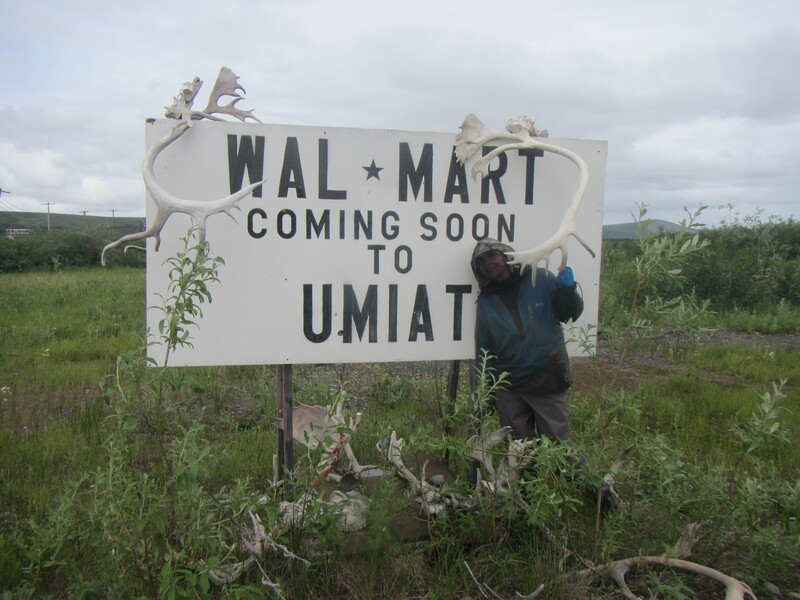 Umiat is a Nunamiut Eskimo name and means “place where the skin boats were drawn ashore during the great flood”. Now there is a scientific and exploration base there used by the oil industry and hunters, but it is only occupied for some parts of the year. Our key task for the day was to stick in the left hand braids so that we did not miss our get out point. Umiat was a mile or so inland from the river, but our maps showed that there should be a jetty. In the end it had been washed away and we were lucky to spot some people on the river bank, which gave us a good indication of where to get out. Seeing other people again was weird. We pulled into the bank and looked at them through binoculars like they were more big wildlife. What would we say to them? Could we remember how to interact with society? We need not have worried. The two guys on the beach were zoologists, about to embark on a down river trip monitoring the peregrine falcon popular. As regulars to the area they confirmed the extreme conditions of the river, suggesting it was three times its normal size. 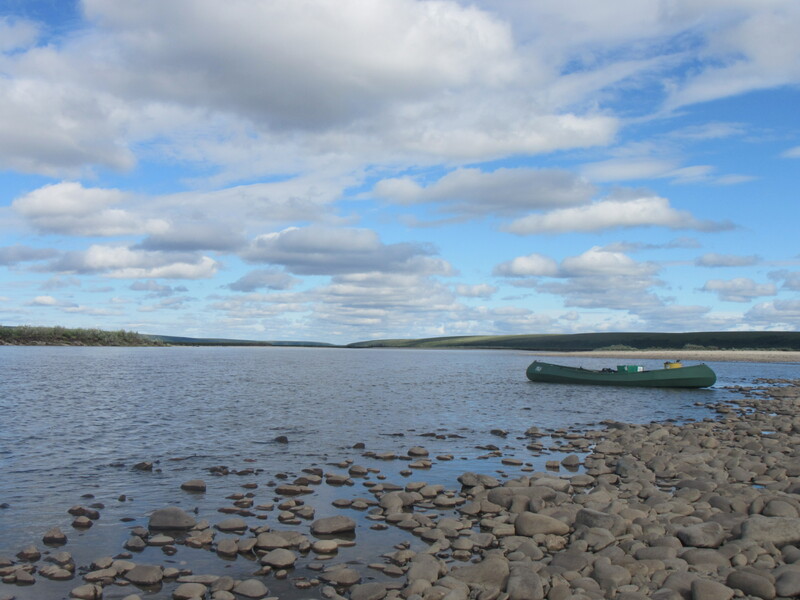 They also very kindly drove our stuff up to the base, so we were just left with the canoes themselves to portage. Once the zoologist had put in and floated off, it was just us and the mosquitoes again. Umiat was deserted. Well apart from the caribou that wandered through town. We had taken out here because there is an air strip so we made camp next to it and explored the base. It was very strange being in an empty town. All that was open was the sauna, but we managed to restrain ourselves from lighting a fire to start it up. The next day a tiny plane came to collect us. It was time to say farewell to the wilderness and head back to the “real world”. 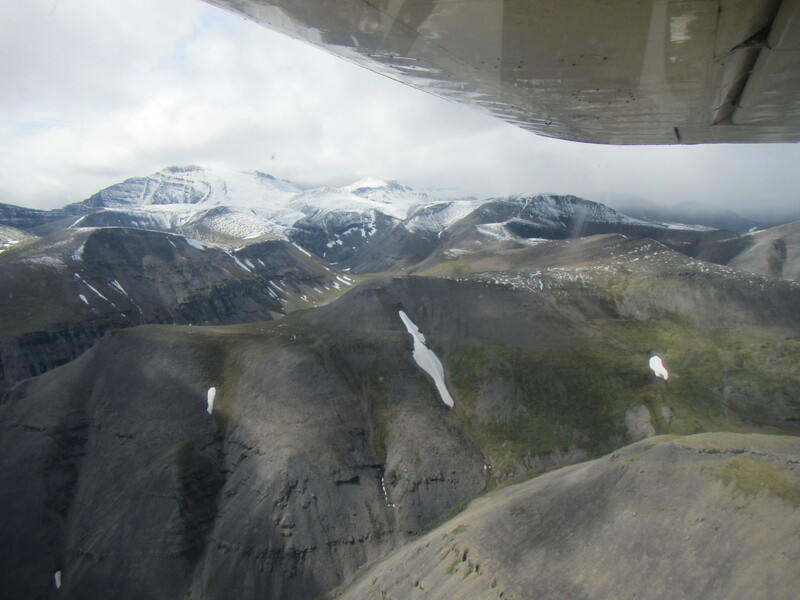 But the hills had once last challenge for us as our little aircraft struck a delicate course between the peaks of the Brooks Range and the base of the clouds. The turbulence was terrible; I was terrified and next to me Andrew was throwing up. All just another day’s work for the amazing bush pilots though.